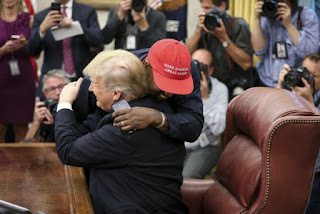 We are all now familiar with the bizarre love hate relationship shared by American President Donald Trump and rapper Kanye West. And their recent meeting only managed to set more tongues wagging because it was probably the weirdest meeting the pair have ever had. Infact The world is still talking about Kanye West’s recent lunch with Trump ― including White House staffers. Many of whom where left feeling “hugely embarrassed” by the president’s Oval Office meeting with the controversial rap star. “If you look [at the president’s] face as Kanye West was doing, essentially, his filibuster standing in front of the Resolute Desk, [Trump] looks speechless and confused, right. [He’s] uncertain quite what to do with this,” Haberman said. The hawk eyed reporter pointed out the facial expressions of Trump’s daughter and son-in-law as further examples of the mixed reaction they had of the meeting. West is famous and infamous for his numerous rants on social media and on stage, so it was a bit of a coin toss whether the erratic Hip Hop artiste was going to go into one of his weird phases. He did. And Trump was at a loss with what to do with the whole confusing delivery. who would blame the commander in chief. Half the time we can hardly tell if Kanye is making all the sense in the world, or absolutely no sense at all.